Week 3 was a bit crazy and I didn't manage to make a square. This is my week 4 square. Even though I missed a week I'm going to keep going with the project and not give myself a hard time. Are you working on any projects? How are they going? Are you able to keep going if you miss a week/day? I love this! I've been bed ridden for the past two weeks with asthma complications, so my project has been reading as many books as I can get my hands on!! 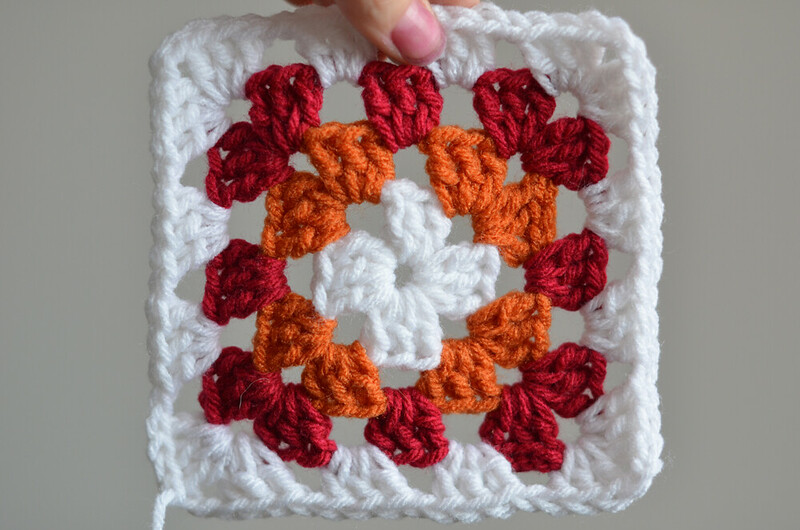 i guess takes longer to make a granny square that we actually think. Can't wait to see the finished project. I want to make a vintage makeover in a small furniture piece i found close to the garbage, need to buy mint paint first. I bet yours will turn out lovely. And that's the right approach too, I think. Once you start stressing it'll only take the fun out of it. I'm learning how to crochet four days now, and I can't wait when I'll be ready for making granny squares!! :D yours look fabulous! this is i made the goal to take a photo of my husband and i every day for the whole year. we did great 2 weeking to jan. and then just failed. but i have not given up, we started again the first and feb. it's not as easy as you'd think!